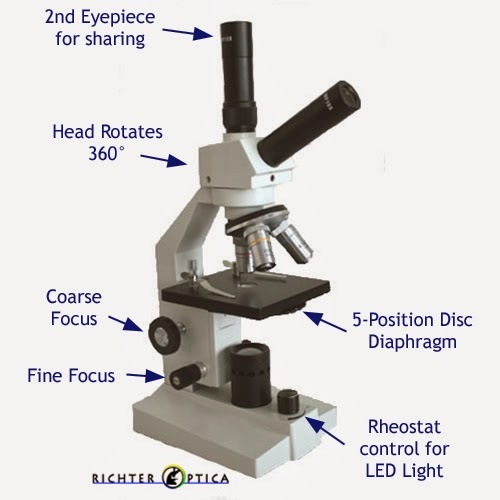 The Richter Optica HS-1+1 is a popular high school microscope for several reasons. Separate Coarse & Fine focusing knobs are important. Without a fine focusing knob, it is very hard to get a crisp and clear image at 400x or higher magnification. A head that rotates makes it easier to position students around the microscope. The 2nd eyetube allows for the addition of a microscope camera, or multiple students can view specimens at the same time. The 5-position disc diaphragm helps adjust the amount of light that passes through the specimen and will allow for crisp images. The rheostat control also allows for light control. Too much light can result in washed-out images. LED lighting is cool and will not harm living specimens. The video below demonstrates the features on the HS-1+1 student microscope.